Sara Ingleby-Mackenzie trained under Ken Hughes, a pupil of Henry Moore, at Bath Academy of Art where she achieved a first class honours degree in Sculpture and was awarded the Henry Moore Foundation Scholarship in 1982. After early exhibitions and commissions, Sara Ingleby-Mackenzie spent a year painting in Cyprus, before taking time out to raise a family. She returned to full time sculpture in the late 1990s. Working in a variety of scales and mainly to commission, her work captures the spirit and form of people and animals. Commissions have included a public art commission for Kandahar Real Estate of Edward Winslow sited in Droitwich Spa, sculptures for Volkswagen, the Nordic Swimming Federation, and creating the iconic "Spirit of Flight" for the Overseas Airline Gazette's 'Airline of the Year Awards'. 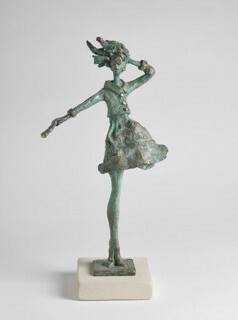 She had also exhibited at Bath Contemporary and been the subject of a Fuji TV television documentary. Her work is held in collections in England and abroad.